Two high school students are still in critical condition at Sanya Nongken Hospital after being injured in a hit-and-run incident in Sanya. The accident happened at about 9:00pm of November 26. The 2 students, walking their way back home, were hit by a No.6 Bus, driving down from Phoenix Town to the downtown center. The driver who was involved in the accident did not remain at the spot to call an ambulance for help and ran away. Ou Fuhao, 17, one of the victims, is still lying in the hospital Intensive Care unit and his classmate has not regained consciousness yet. “My nephew is still suffering life-threatening injuries since 10 days have passed. I am so afraid that he will leave us at any time”. At 3:00 am of November 27, the bus driver presented himself to the police. Asked for the reason he ran from the spot, he said he was so scared he didn’t know what to do. 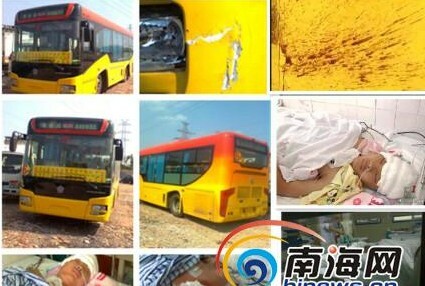 Asking for more responsibility for the accident, the bus company refused after giving 50,000 yuan as compensation for medical expenses. “The medical care costs 7,000 yuan per day. It is a huge economic burden for our family”, sighed Ou’s parents who are both farmers.